Smart spending on mental health is an investment in Canada’s mental wealth. Momentum is growing to make wise investments in mental health. Building upon the 2013 release of the Mental Health Commission of Canada’s (MHCC) Making the Case for Investing in Mental Health in Canada, which laid the foundation for investing in the mental health of people in Canada, Strengthening the Case for Investing in Canada’s Mental Health System: Economic Considerations (Strengthening the Case), does more than reiterate the importance of directing funds to mental health. It provides economic rationale for investing in best practices that can improve mental health outcomes while bolstering the bottom line. 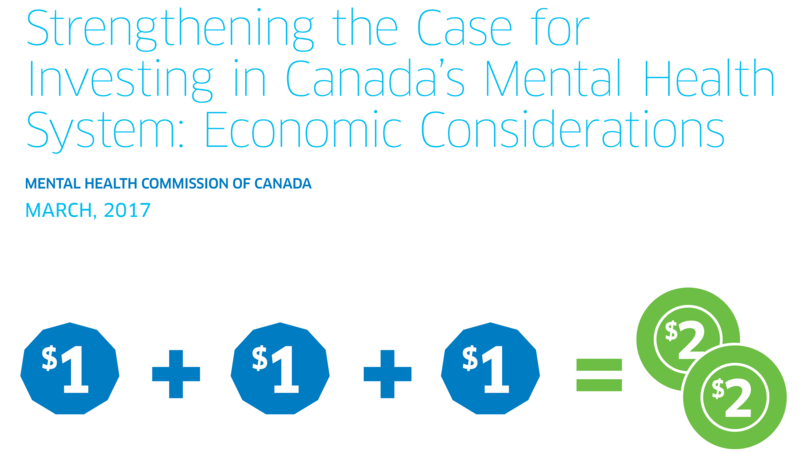 As policy makers, healthcare administrators and elected officials seek to make difficult decisions about where to invest money in mental health programs and services, Strengthening the Case reinforces the value of following the roadmaps laid out in Changing Directions, Changing Lives: Mental Health Strategy for Canada and the 13 provincial and territorial mental health and addiction strategies. With a cost to the Canadian economy of over $50 billion, 1.6 million Canadians reporting an unmet need for mental health care, and 7.5 million people in Canada living with a mental health problem or illness, the time for action is now.